​Frisco's Coolest Celebrity Magician Kendal Kane! Imagine a birthday party so filled with laughter and joy that your child remembers it forever. Impossible? 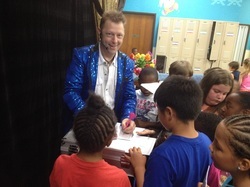 Frisco Birthday Party Magician for kids Kendal Kane GUARANTEES it. Your child is the star in 3 entertainment packages of the new “Magic Zone” show! Children don't want to sit and watch during the birthday party. They want to get involved! Adults are equally involved in the magic show making it a Clean Family Fun Environment. Frisco Birthday Party Magician Kendal Kane selects volunteers to help out with the magic and every volunteer is treated with respect making sure everyone is having a good time. Of course the true star of the magic show is the birthday child which magic happens right in their own hands! We transform the birthday kid into a magician, and they will perform their own feat of magic truly making them a star!